*Secure, Protect & Hide your information, like: Gallery, Documents, Passwords & more! *ANTI HACK FEATURES - Many different ways to lock and secure - Monitor who tried to hack into your phone! *Cloud backup - Always keep your data safe in the phone as well as the cloud. *Notes, To-do list, Voice Memos, Gallery lock, Advanced Data Security & more! Folder Lock® Advanced is a more sophisticated version of Folder Lock® for Windows Phone, boasting better graphics, new features and overall performance. 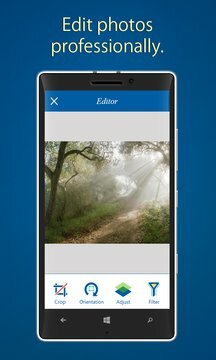 Introducing Gallery Lock, which encrypts your photos and videos. You can also secure, documents, wallet cards, notes and other types of data on your Windows phone. Lock documents, Galleryand a lot more via Folder Lock. Best of all, you have the option to upload locked data to your Dropbox account. In all, this app is the Swiss army knife for smart phone data privacy. So lock everything with Folder Lock! Folder Lock Advanced is the most comprehensive data privacy and file manager, phone locker app that is available for Windows Phone. Gallery lock is Folder Lock’s newest feature. 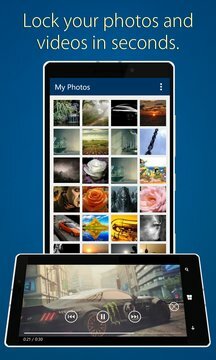 With Gallery Lock’s secure gallery, you can now view photos and videos in one option Gallery Lock option. The hide gallery feature makes Gallery Lock even better. You don’t have to worry about losing your sensitive data. Easily and conveniently backup all your locked files to your Dropbox.